Guitarists that also enjoy building electronic devices using the Arduino platform may be interested in a new Arduino guitar pedal shield aptly named the pedalSHIELD. 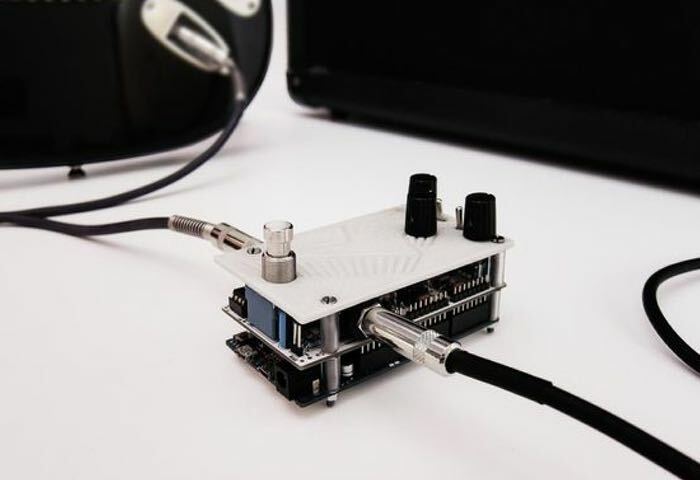 pedalSHIELD is an open hardware, open source system that has been specifically designed as a platform to learn about digital signal processing, synthesisers and guitar effects. To be able to use the Arduino pedalSHIELD no in-depth knowledge of electronics or programming is required, but effects can be written in C or C++ or if you prefer to skip the coding part can be directly downloaded from the online library. – The Input Stage or Preamp: Amplifies the guitar input signal and sends it to the Arduino microcontroller to be processed. – Arduino Board: It does all the Digital Signal Processing (DSP) modifying the signal and adding the effect (delay, echo, distortion, volume…). – The Output Stage: Once the waveform is processed, the signal is taken from the Arduino DACs and prepared to be sent to the Guitar Amplifier. This part also includes a Summing Amplifier which is very useful for delay effects like echo or chorus. For more information on the Arduino guitar pedal watch the video below for a quick two-minute overview of its features and functions. Full specifications are also available from the ElectroSmash website via the link below.